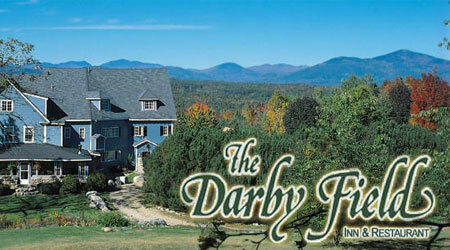 The Darby Field Inn and Restaurant has been serving Valley visitors delicious food with a view, all in a country setting for more than 30 years. Come out of the cold this season and spend an evening with us; warm up in front of our huge fieldstone fireplace, gather your friends in our dining room for dinner and drinks, or relax in Littlefield’s Tavern over a game of Cribbage. Revel in traditional favorites like Crisp Roasted Half Duckling, accompanied by raspberry Chambord sauce. Experiment with our innovative specialties such as Butternut Ravioli tossed in a chili cream sauce and garnished with spiced pecans. Walk on the lighter side with our signature salad, Darby Salad (green leaf lettuce, tossed in our homemade vinaigrette and topped with bleu cheese, dried cranberries and toasted pecans), or the Chase Hill Chicken Sandwich (served open faced on sourdough bread with fresh mozzarella, roasted red peppers, pesto and spinach). Complete your evening with one of our Inn-made Desserts and a cup of Green Mountain coffee, or try a Special Coffee Beverage from our imaginative list. Whether you join us for a quick bite and a beer in our tavern, or a full evening of hospitality, wander off the beaten path to The Darby Field Inn and Restaurant, where dining is more than just food, it’s an experience! Our restaurant hours change seasonally. We recommend making reservations. So you know when the next sale is!